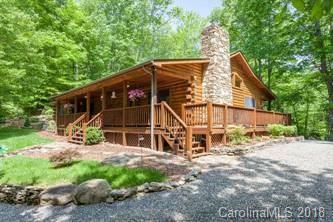 334 Whispering Pine Lane, Burnsville, NC 28714 (#3416055) :: Robert Greene Real Estate, Inc. Sequestered on wooded site, this 3BR/3BA Log Home with covered front and rear porches offers the peace and serenity that you've been looking for! This one-living open floor plan has great room w/native stone woodburning fireplace, cathedral ceiling and kitchen complete with appliances. The M/Bedroom opens to porch and bath has claw footed soaking tub plus shower and two pedestal sinks. There's space for everyone with two additional bedrooms and separate office for those who work remotely. Home built in 2001 but completely remodeled w/addition in 2010 with all details overseen by Owners. The grounds are meticulously landscaped plus stone waterfall-fountain and pond provides the ambiance to relax in rocking chairs on covered porch. There's even walking trails through woods for the adventurous! Located just outside Town of Burnsville, this can be your private oasis! Too many details to list here, call for additional information!